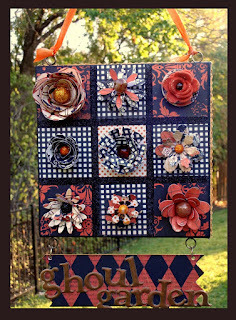 I am so excited to be a part of the Ghoultide Blog Hop sponsored by the amazingly talented Angela Holt ! Now that you are here, you are about halfway through the hop!! Be sure to keep going...there are more frightfully wonderful projects for you to see. I wanted to create a Ghoulish Garden for you to visit. It all started with a 6x6 canvas and papers from Authentique. LOVE those papers. To make the grids, I used ScorTape and then sprinkled Martha Stewart glitter over the super tacky adhesive. I just love the look of the black glitter. All of the flowers are cut from dies from two of my favorite companies - MFT Stamps and PaperTrey Ink. Be sure to check them out too. 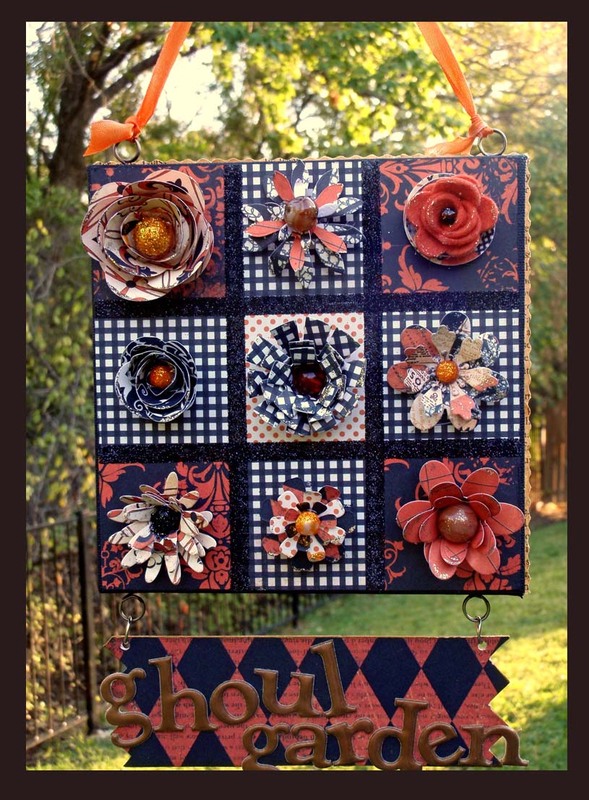 Below I have listed and linkled ALL of our great Blog Hop Gals. That way you can come back here and always reference this list when you need some inspiration. If you have begun here, then you need to hop to Angela's Blog at http://theblingtheory.blogspot.com so you don't miss a single spooky thing. Happy hopping and see you tomorrow. OHHH, this is a fabulous project!! The details are amazing!! Thank you so much for being a part of this blog hop!! Amazing project. Thanks for sharing. That's a neat idea! Thanks for sharing! AWesome !!! GREAT PROJECT !!! tfs!!! Very cute project thanks for sharing and im a new follower here. I can't wait to see more projects from you. Be sure to stop by my blog to enter my 500 followers giveaway and stop by my blog for current hops I'm in and a chance to win even more blog candy!